If you’re an Indy resident or simply planning a trip there this winter, you’ll find no shortage of exciting events to attend on your own or with loved ones. From magic shows to music fests, there are plenty of activities to fill your calendar all season long. Here are just four Indianapolis events worth checking out this winter. If you’re a fan of card and magic tricks, the IndyFringe Winter Magic Festival is your chance to indulge in mind-blowing performances from some of the world’s most talented illusionists and sleight-of-hand aficionados. This four-day event is full of live action entertainment, including stunt shows, mentalist demonstrations, and comedic acts, making for a thrilling outing your family is sure to remember. No official date has been set for the upcoming Winter Magic Festival, but this annual event typically takes place between mid- to late January, so stay tuned! Are you someone who enjoys listening to music and hitting up concerts throughout the year? If so, the Winter Jam Spectacular is a great way to get in on the action this holiday season. 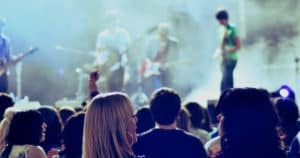 Located at the Bankers Life Fieldhouse in Indianapolis, this music fest features a unique lineup of performers, including Christian rock group Skillet, hip-hop artist KB, R&B pop sensation Jordan Feliz, and country singer-songwriter Mallary Hope. If you’re interested in attending, tickets are just $15 at the door. Indiana University-Purdue University Indianapolis will be hosting its annual IUPUI International Festival this coming February. This free event is open to the public and lets you immerse yourself in the cuisine and cultures of countries from around the world. Free food is enough to entice most visitors, though you’ll also have the opportunity to enter contests and win prizes as well as enjoy live entertainment from a diverse group of dancers and musicians. Plus, the 195 flags of the United Nations will be on display in the IUPUI Campus Center, so be sure to check them out during your visit. The last event on this list is the Indy Winter Blues Fest. Get to know some of the area’s most talented blues artists, including Harvey Cook, Mike Milligan and Steam Shovel, and Django Knight, as they take to the stage at the Birdy’s Live music venue. Admission is just $15, and you must be 21 or over with an I.D. to enter. Performances start at 8 p.m. and end at 11:30 p.m., but you can stop by at 7 p.m. for early access. If you’re in the mood for some good blues music, this festival definitely deserves a spot on your itinerary. Are you looking for fun events to attend in Indianapolis this winter? Well, search no more! These four upcoming festivals promise plenty of excitement, and what better way to enjoy them than with friends and family?